The prehistoric bone club was only wielded by the mightiest of Neanderthals; the ones who were strong enough to hunt a menacing dinosaur with a sturdy bone structure. If you're planning on being king of the cave and have your leopard tunic already, adding the mighty bone club to your ensemble is a must. During the dawn of man only the strong survived, and the famed dinosaur club was sure to assert your dominance. 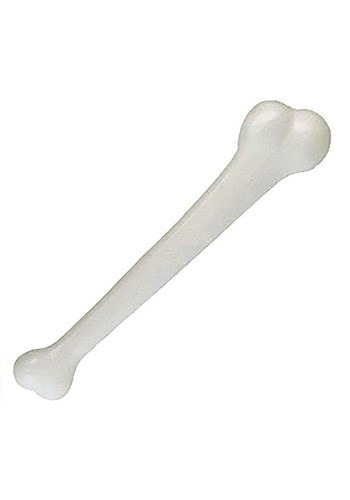 Plus, the bone is picked clean. An appetite like that can only come from someone who's worked for it! But know, that great power comes with great responsibility. So, what exactly is this bone from? It kind of looks like a shin bone from a poorly drawn Apatosaurus. Or maybe a femur from an oddly-shaped sabre tooth tiger? Not sure. Wherever you want to pretend you found it, works for us.